Disclaimer: These prices do not reflect the fees charged by Collins Accounting and Tax Service to prepare your return by one of our preparers through our office. 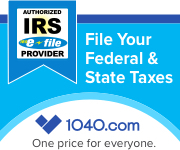 These prices are charged by Drake Enterprises, LTD to self-prepare and file your own return through 1040.com. There is field-level and page-level help offered throughout the preparation process. Collins Accounting and Tax Service will not be able to answer any questions regarding tax laws or how to fill out specific forms. If you are unable to complete your return and require additional help we can prepare your return in our office at our regular fees.